We are very excited at EatFit to announce a new dietitian training course we have devised for South African dietitians. Please come join us for two days jam-packed with information and research about the dietary management of Irritable Bowel Syndrome. The course will look in depth at the research and guidelines for managing IBS patients with diet and will be interwoven with real life patient case studies to apply your learning. 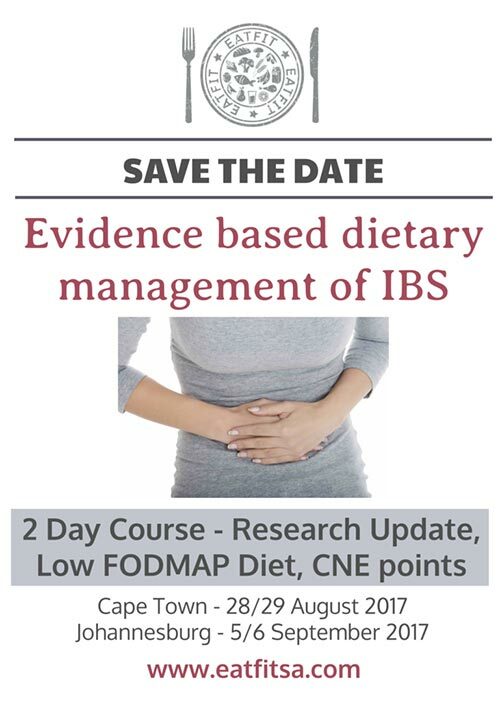 Day 1 provides a comprehensive review of the evidence for first line dietary management and Day 2 will look at the research underpinning the low FODMAP diet (in IBS and other conditions) and interventions beyond diet. This course is a research based course and will look at the evidence on IBS & Diet. Once delegates have completed Course 1 they will be eligible to attend Course 2. Only dietitians that have attended Course 1 will be able to register for Course 2. This one day course will provide the practical ‘know how’ on the low FODMAP diet and running an IBS patient programme from A-Z, incorporating the low FODMAP diet. The course will provide training on how to run low FODMAP group programmes and detailed guidance on the low FODMAP dietary management process from elimination to rechallenging.